The term "Waltz" in the Regency era was a bit less precise than it is now. The familiar 3-4 time we associate with the Waltz was not an absolute requirement. "Waltz" seems like it could refer to any dance where two people rotated together, either as partners through the whole dance or in a figure that was part of a set dance. 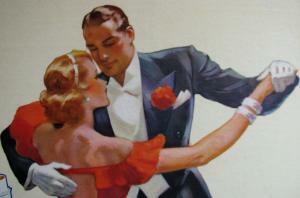 There were four distinct classes of partner Waltzes. In addition, there are a number of set dances which called themselves waltzes, but which are varied enough in structure that I am reluctant to make a broad pronouncement that all such dances should be performed in some particular way. Each, I fear, will have to be addressed and deciphered on its own. 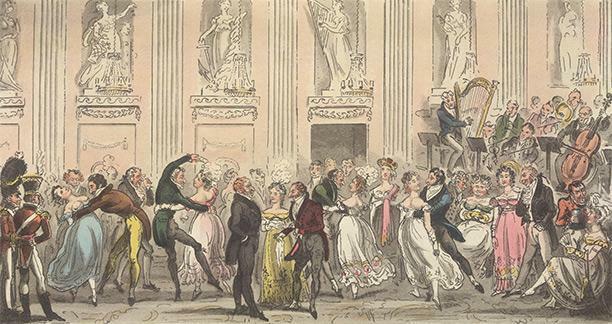 In "Mr Nelson's System", I will for the moment exclude the German Waltz and the Jetté Waltz as being too different from our concept of the Waltz, and focus on bringing an understanding of the Regency style in the more familiar 3-4 waltz step. This will mean a focus on the Slow French Waltz with a brief digression to the Sauteuse. I will save the less familiar waltz variations for a time when we have thoroughly digested the French Slow Waltz, and are hungry for new challenges. 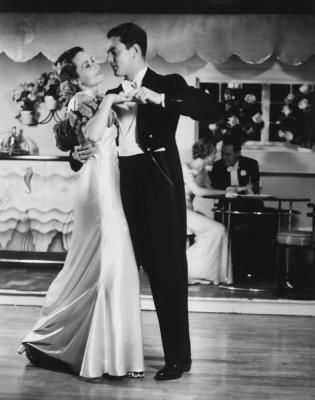 In the 20s and 30s, the Waltz was evolving. 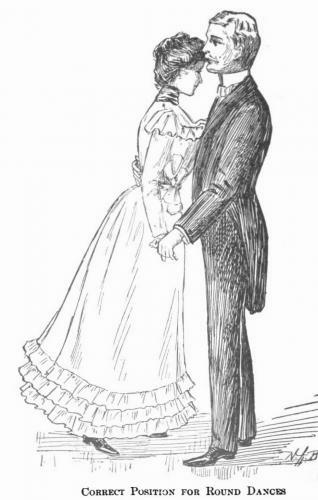 The "old school" rotating Victorian Waltz was still in evidence in the English speaking world, but was being edged out by the "Modern Waltz" with a less directional and kinetic style with partners swaying back-and-forth or moving in a linear manner rather than pivoting around a circle. 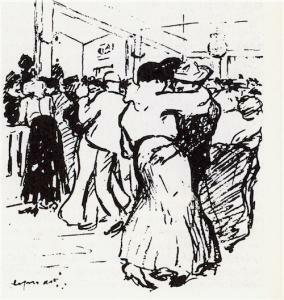 In this period, waltzers used the very close Jazz Age embrace and as with most of the other ballroom styles of the time, the partners seldom left their close embrace. The underarm turns and the like, which are popular today were practiced primarily by professional exhibition dancers and not social dancers. With the partners in the embrace, steps were small and the dance was fairly contained and restrained, and generally did not display the sense of swooping and broad motion that modern competition ballroom Waltz now has or the high-speed, rapid rotation of the Viennese Waltz. The Modern Waltz was elegant, romantic and quite intimate and like most of the ballroom dances of the era, was a conversation between partners, with little concern for putting on a show for any external audience. The Waltz is in 3/4 time. There are three beats to every measure, and in a waltz, the first beat of every three has a clear accent. A waltz phrase is two sets of three, and could be expressed as ONE-two-three-FOUR-five-six. It's best to start your figure on the first beat of the 6 beat phrase. The key steps are on the strong downbeat at the beginning of each 3 beat measure. This basic step preserves the ONE-two-three timing of the step, but is danced Foxtrot fashion with the lead mostly backing the follow. The man steps forward with his left, shading slightly to the left, brings his right foot on line with his left and then brings his left next to his right (Left-Right-Together). He then does the mirror of that, still going forward, but shading a little to his right (Right-Left-Together). The lady, of course, does the opposite while backing. He may occasionally reverse and back up along line of direction, but mostly he backs her. However, if you take this step, and mix it up with the man stepping backward on the second 3-count phrase, then you have the Box Step. However, if you do this in the current style as an actual box, with equal sides, long steps and 90 degree angles, you're missing the point. Don't think "box" think "back and forth sway". With each step, turn a bit, side step a bit, cross-step a bit - rove all over the floor (but more or less in line-of-direction) and don't worry too much about exactly where your feet end up, so long as you keep on the beat and off your partner's toes and don't bump into your fellow dancers. And of course, in the free flowing dance of the Jazz Age, you can at any moment revert for a while to an old-fashioned pivot Waltz, and then switch back just as quickly to a more modern step - because it's the Jazz Age, and that's just how it is. 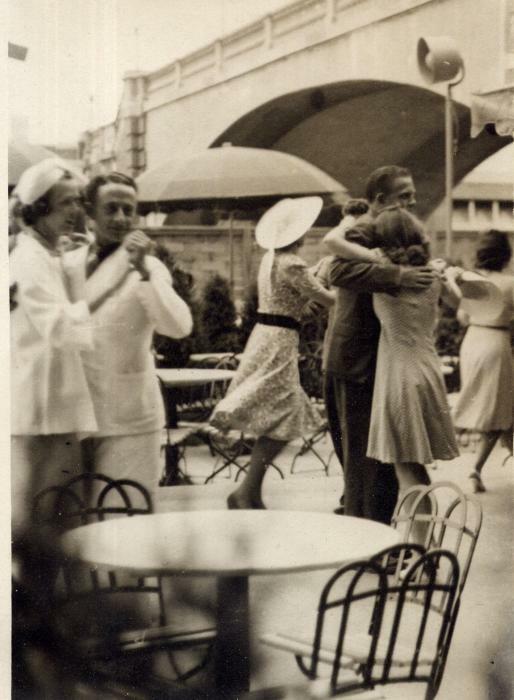 I am frequently asked, when discussing the Waltzes of the "Jazz Age", what they were doing in the time between the World Wars in the spiritual home of the Waltz: old Vienna. There certainly appears to have been a Viennese style of Waltz in use at the time that was distinctly different from the "Modern Waltz" so popular in the US and Britain. The "Modern Waltz" with its walking steps and box-step back-and-forth sway had rotation (often intermittent) as an option. In Vienna, it was all about the rotation and the faster the better - aimed at a sense of swirling and floating across the floor. My working hypothesis, supported by admittedly thin data, is that the Viennese style predominated in Austria and Eastern Europe (Poland, Czechoslovakia etc.) It also seems to have been a choice at formal, white tie sorts of balls in Germany. 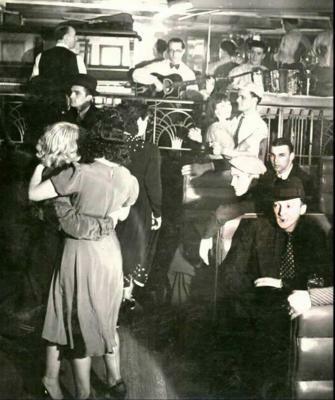 However, it looks like the "Modern Waltz" was predominant on the floors of fashionable Berlin nightclubs - and it also works better on a crowded floor. So, here is some of my rather sparse data set: a clip from 1934 from an Austrian film. It depicts a very kinetic, fast moving rotary Waltz in the 19th Century tradition, combined with the intimate close hold of the Jazz Age. With this fast rotation and close hold, the turns are very tight, like spinning on the head of a pin. It's followed by a clip from a Polish film from the '30s. I find it interesting that the dancers in the first clip do most of the visible portions of the Waltz in a reverse rotation. The Java was a distinctly French Waltz variation danced to a bouncy 3/4 beat. The distinction between a Java and a Waltz was not a clear bright line. Bouncy moderate tempo Waltzes, which sound a bit like a Victorian Waltz-Mazurka, were definitely "Java", but the film evidence suggests that individual styling and step choices were all over the map, with a lot of dancers doing their own particular favorite style to most any tempo, whether it be a Java type step or something else. The main difference between the classic Waltz and the Java is that the Java tempo lent itself to a bouncy step (one walking step per beat, with equal emphasis on each step, a slight bounce in every step and a bit of hip and shoulder action) which in these clips you can see a lot of people dancing - though many seem to be just doing their usual mix of Waltz steps, turns and pivots. You can also see a lot of variation in style, from a sensuous sway to a jerky hop to a smooth flow to a continuous rotation. Also, in keeping with the French dance style of the Jazz Age, they kept it really simple. You don't see elaborate step patterns or practiced dance routines. The couples just moved around the floor doing pretty much the same one or two things through the whole dance and they didn't separate until the dance was over. As usual, no underarm turns, throw-outs etc. Below is a compilation of clips from European films of the '20s and '30s, showing the Java being danced in a variety of venues, from a seedy dockside tavern to a posh Parisian cafe. The second scene, which is actually from a German film, where the woman drapes herself over the man and they rock back and forth suggestively, is the classic, perhaps even stereotypical, low life, "apache" (pronounced ah-pash) style (note, one step per measure rather than the usual three). On the other extreme, the scene where Jean Gabin dances with the nice old lady, shows a style where he lifts up on the balls of his feet, rather than dancing flat footed as most do, and this gives the Java a smooth, graceful, civilized flow. After all this, I suggest doing as the Parisians did: hold your partner close and dance your dance in the style that suits you. I will use the imprecise term "Valse Musette" to describe the Parisian Waltz of the Jazz Age. The tempo of such a Waltz could be slow and sensuous or incredibly fast - too fast for most dancers to do a Victorian style rotary Waltz or 20th Century style box-step to, but not at all difficult if you stick close together and take very small steps - or even step on only a third of the beats. While there are slow and moderate tempo waltzes to be found in the Jazz Age French repertoire, the most frequent tempo is EXTREMELY fast, giving the dancers the choice of either spinning like tops or slowing it down and keeping it cool and mellow (spinning too fast could extinguish your cigarette). Mon Amant de Saint Jean as performed by Lucienne DeLyle is a nice example of this tempo. The hold in such a Waltz is very close. It is an embrace. Further, there is no one approved "ballroom hold". They can be in a more or less "standard" hold, the man can have both hands behind his partner's back (anywhere from her shoulders to somewhere around her derriere), or one hand on her back and the other at his side, on his hip or in his pocket. The man could also hold his left (his partner's right) hand to his chest, to further accentuate the embrace. Further, there is no one way to step. The dancers could take very distinct steps with a bit of a bounce or completely smooth; simply shuffle in a either a three step walk (a short step on every beat) or a two step shuffle (one step on the down beat, the next between the two following beats but without changing weight) or frequently, a single step on each down beat (left-2-3, right-2-3). This simplified step is particularly useful in one of those ultra-fast French waltzes, though it can be seen when the waltz is in a slower tempo as well.